Yesterday, Microsoft offered those keen to test Windows 8.1 a chance to do so, and in a follow up to the Windows Store update, a downloadable and mountable ISO image has just been made available for traditionalists. Windows 8 has been a rather polarizing release, but the consensus seems to be that Microsoft has brought through some favorable changes with Windows 8.1. 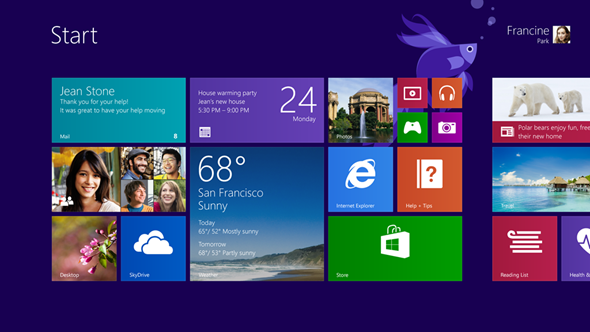 The Start screen, for example, caused quite a bit of controversy with long-time users, offering a bunch of tiles as opposed to the usual PC menu to which users had become so accustomed to. The confusion caused translated into slower adoption rates by the masses, and although the numbers shifted were comparable to that of Windows 7, one would expect improvements, with more users jumping on such a big statement of change, rather than the plateau that was. The improvements in Windows 8.1 are clear for all to see, and with the new universal search function allowing users to find local documents and perform Web searches in one fell swoop, a great deal of effort has been made to enhance general functionality and user experiences. Apple, with its OS X platform, has enjoyed continued success meanwhile, and although the Cupertino company’s progression is by no means comparable to Windows, the folks in MS will doubtlessly be feeling the heat. Still, the software maker seems to be coping pretty well, and Windows 8.1 is a testament to that. Moreover, the Windows Store appears to be gaining traction at just the right time. As the company’s CEO, Steve Ballmer, noted yesterday during the first day of the BUILD developer conference: ‘‘Within this month we’ll pass the 100,000 app mark in the Windows Store," and although the lack of apps therein has been pointed out as a major flaw in the Windows 8 platform, things now look to be taking shape. Once you have downloaded and installed, be sure to leave your comments, thoughts and critiques via the usual mediums below!